Cleaning the outside of your windows usually isn’t everybody’s favourite thing to do; however, cleaning the exterior of your windows is an important piece of maintaining your home’s value. There’s no need for this chore to ruin your summer. 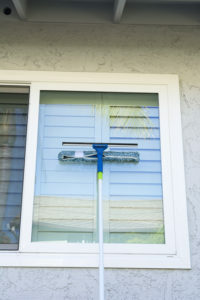 Read on for Marcotte Glass’ tips to making outdoor window cleaning a breeze. One of the reasons people hate washing windows is that they tackle the job with a roll of paper towel and a lot of elbow grease. The truth is, all that rubbing isn’t doing you any favours. You usually just end up moving the dirt around from one spot to another, as well as putting a static charge on the glass, which attracts dust and dirt. So treat yourself and buy the same tools as the pros! You’ll see better results with half the effort. There’s no need to spend a ton of cash on a window cleaning solution. Window cleaning has more to do with your method of cleaning than the solution your using. A drop of dishwashing solution in a bucket of warm water will work great — and save you money! The technique you’ll want to use will depend on what type of window you are dealing with. If you are working on a large picture window, start at the top left (for lefties, top right), and pull the squeegee in a reverse S pattern. If you are working on a multi-pane window, you’ll want to simply pull the squeegee straight down. Important: after every stoke make sure you are wiping the blade clean with a lint-free rag. If you have a divided-light window, you need a squeegee that fits the panes. It can be hard to find a squeegee that is just the right size — so just customize it yourself! You can easily cut one to size using a hacksaw. Simply cut the metal channel 1/4 inch narrower than the window pane. Then trim the rubber blade using a utility knife to the pane’s full width. If there are any drops of water left on the window after you’ve finished with the squeegee, make sure to wipe them off with a damp, wrung out chamois cloth. Any leftover water drops will dry and leave unsightly spots on your windows. The damp chamois cloth works well as it soaks up wetness without leaving any streaks. Important: don’t forget about the windowsill! You can use any rag to dry those off. It’s important to not wash your windows when the sun is shining directly on them. Why? Because the water will evaporate before you have a chance to squeegee it off, which will leave you with a spotty mess! The ideal window washing day is overcast, but not raining. If you can’t seem to manage one of those days, just work around the sun’s schedule so you are washing in the shade. You’re now equipped with some of the best window washing tips around. Go forth and use them wisely. If you have any questions about your windows, or how to clean them make sure to give the team at Marcotte Glass a call. They are knowledgeable and always ready to help.